Ghanerao is a small principality founded in 1606. The magical castle that is now a heritage hotel is an easy and comfortable access point for excursions to the Kumbhalgarh Fort, Kumbhalgarh Wildlife Sanctuary and the Jain temples of Ranakpur. 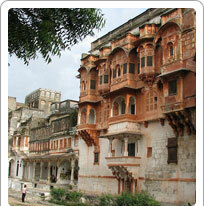 Ghanerao is strategically located between Udaipur and Jodhpur. It is 120 km from the Udaipur Airport and 36 km from Falna railway station. It has fourteen classy rooms and two suites. Made of red sand stone, the castle structure is easy on the eyes and its interiors are also beautifully done up with the region's furnishings and crafts, including miniature paintings. There are a number of old temples, step wells and marble archways in the village that can be explored during a lazy holiday. Ghanerao is also known for its paintings. Painters from the courts of Mewar, Bikaner and Jodhpur who settled here have blessed it with a rich heritage of art. The environs here also encourage the visitors to paint in the relaxed surroundings. Also available are horse and jeep safaris o view the wildlife and birds. Bagha-ka-Bagh (Tiger Den) is a jungle lodge in Ghanerao. Situated against the backdrop of the Aravalis in the midst of a jungle, it is an ideal place for treks through tall grass jungles that can last up to three days. Campfires are organised for the visitors while the Garacia tribe found only in this belt sing and dance telling tales of Rajasthan's history. Bagha-ka-Bagh has eight rooms in a fortress like building.